After a three-and-a-half-year journey of 2 billion miles, a Japanese space probe last week dropped a pair of hopping, grapefruit-size rovers on an asteroid called Ryugu and began beaming back snapshots from the surface of the bizarre little world. The feat marked a trio of firsts: First soft landing on an asteroid, first deployment of rovers in a low-gravity setting, and first close-up look at the sort of celestial object that might have helped seed life on Earth billions of years ago. The images coming in from the Hayabusa 2 probe also afforded another, more personal first: a glimpse of an alien landscape unlike any humans have ever seen. “I cannot find words to express how happy I am,” Yuichi Tsuda, Hayabusa 2’s project manager, said in a written statement just after the landing. Hayabusa 2 has been slowly building to this moment since its December, 2014 launch. Nudged along by the gentle thrust of its engines, the spacecraft finally caught up with Ryugu in June and began nestling up to its target before deploying the rovers. The half-mile-wide asteroid confounded expectations right from the start. Now that the tiny rovers, called MINERVA II-1a and MINERVA II-1b, are able to have a closer look, the odd asteroid seems even odder. “It looks like some volcanic lave flow on Earth, like Izu-Ohshima island in Japan or the Big Island in Hawaii,” Watanabe said. The Hayabusa 2 scientists are excited by the jagged terrain because it offers insights into the asteroid’s violent past. Understanding these small bodies also provides crucial context for NASA’s OSIRIS-REx probe, currently en route to a similar but slightly smaller asteroid named Bennu. 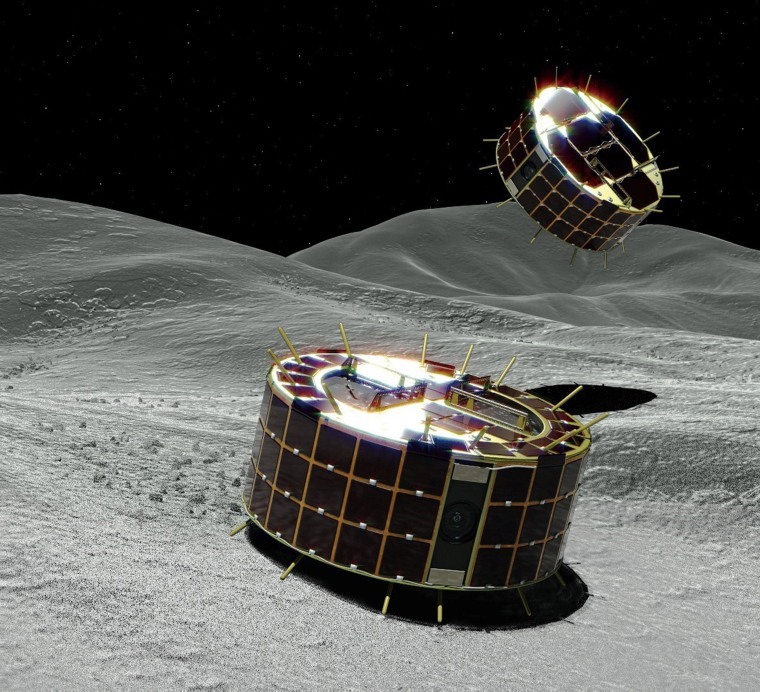 The Hayabusa 2 team expects that studying Ryugu will enable them to fill in some of the gaping gaps in our understanding of how asteroids and planets form and evolve. Astronomers can observe young stars surrounded by dusty disks where planets seem to be forming. They can also see the end result in our solar system: a few mature planets along with millions of asteroids large and small. What they can’t see is what happened in between, when countless collisions among these celestial bodies created, smashed and recreated the building blocks of planets. Somehow that process left Earth with the water and organic compounds that allowed life to emerge. In addition to the rovers already deployed, Hayabusa2 has two rovers still held in reserve. A larger, more complex rover called MASCOT, built by DLR (the German Aerospace Center), could touch down on Ryugu as early as next week. Another rover, confusingly named MINERVA II-2, will follow next spring or summer. And placing rovers on Ryugu is not even the most audacious part of the mission. “Touch and go operation for sampling will be very difficult for such a rocky asteroid. An impactor experiment to make an artificial crater on Ryugu is also risky attempt,” said Watanabe, teasing two of Hayabysa’s key activities that are yet to come. For the impactor experiment, explosive charges will propel a four-pound slug at Ryugu at more than 4,000 miles an hour. When it hits, the slug will blast away part of the asteroid’s topsoil, exposing fresh material to study. Since the main spacecraft will have to back away from the asteroid in order to protect itself from the blast, it will deploy a free-floating camera called DCAM3 to grab pictures from the moment of attack. That should be quite a sight. “Touch and go” refers to the ultimate highlight of the Hayabusa 2 mission, when the main craft will lower itself to Ryugu’s surface, scoop up bits of the surface, load them into a canister and then send it back to Earth. If things proceed as planned, the canister will parachute down over Australia in December 2020. That will be yet another first: first time a fresh sample of a carbon-rich asteroid will return to Earth for detailed study. When the OSIRIS-REx probe touches down on Bennu, it too will collect a sample and return it to Earth. The idea is that scientists will be able study the two asteroids not just from remote measurements, but by examining them atom by atom. They may be small worlds and small spacecraft, but the lessons they teach us could be enormous.